A luxurious city in Tokyo, Ginza. 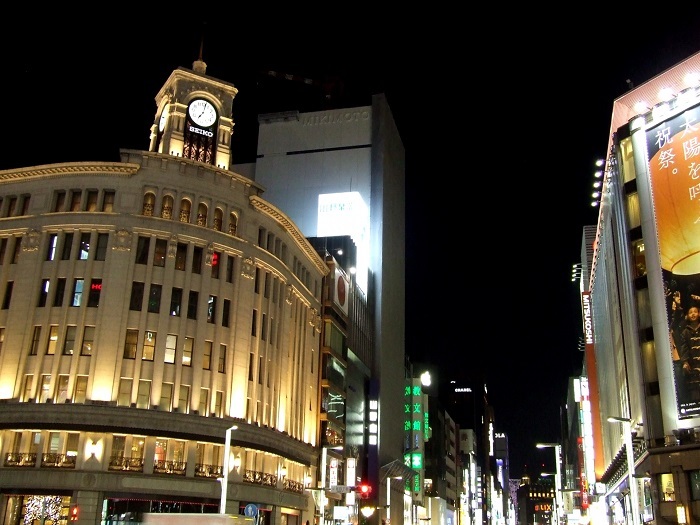 Many high-end brands, department stores and high-end commercial facilities are gathered.When you search for gourmet spots in Ginza like that, it tends to precede images with high thresholds.However, there are many shops that can enjoy eating and drinking reasonably around Ginza. So this time we introduce 10 reasonable dinner gourmet spots around Ginza by budget.Only stores with outstanding ease-of-use with reduced budget! You will be able to enjoy the money gently. The good news to you is the sushi pub in the corridor street, “Banya”, a 4-minute walk from Ginza Station.All sushi and cooking are clearly accounting and reasonable, so you can enjoy your meal with ease. The price of sushi is consistently 200 yen to 500 yen.It is also attractive to be able to enjoy reasonably at Ginza.We have stocked fresh ingredients more than the price, you can enjoy sushi and seafood dishes with high cost performance. Inside the store is a Japanese modern space and private rooms are also available.It will be useful in a wide range of scenes from personal use to family and group use. Stylish shop that imagined the sky.A calm space feels the warmth of the tree.Private room seats are also available and you can enjoy it without worrying about the surroundings. This shop is very rich in Japanese craft beer handling.The number is about 50 kinds.You can taste various craft beers from sweet to refreshing. Recommended for cooking is “Niku Niku Plate（肉肉プレート）”.It is a must-have menu that is satisfying to eat a wide variety of meat dishes. It is 3 minutes on foot from Ginza Station.If you enjoy craft beer and meat dishes in a stylish space, I recommend SORA-bal. A 5-minute walk from Ginza Station Exit A3, an Okinawan specialty restaurant. It is a shop as if you came to Okinawa.The calm lighting is attractive and the atmosphere is great. You can taste various Okinawan dishes such as Goya Chanpuru and sea grapes.Besides food, we also handle Okinawa’s sake “Awamori”.There are more than 50 types of awamori, the number of products in Tokyo. The feature of this shop is that it fulfills such a request.Even in Ginza, it is a restaurant where you can enjoy the location and food of Okinawa. There is a 30m river flowing space in the store. The length of the river is the largest in Tokyo.A tasteful shop interior with Wa（Wa-Japanese culture-） in mind. It can be said that it is a Japanese dignified interior. You can enjoy local cuisine from “Kochi” at this store.Among the local dishes, please try “Katsuo no wara-yaki（Straw grilled）”. The flavor and aroma of Katsuo are attractive.It is a good food to eat with salt. It is a 2-minute walk from Ginza Station Exit C1.You can taste the local cuisine of Kochi in the nice shop. This restaurant serves local cuisine from Nagoya.Mainly, you can get Nagoya dishes such as “Miso-oden（味噌おでん）”, “Kushikatsu（串カツ）”, “Tebasaki（手羽先）” and “Taiwan ramen（台湾ラーメン）”. The popular menu of this shop is “Taiwan Motsunabe（台湾もつ鍋）”.Mince soup with chili peppers is a bit spicy but delicious.White motu is soft and tasty here.It is a menu that I would like you to order regardless of the season. It is a 4-minute walk from Ginza Station.Please have delicious “Nagoya cuisine” in the Ginza area. This store is a 3-minute walk from Yurakucho Station.It is a shop where you can enjoy the Osaka specialties “Okonomiyaki（お好み焼き）” and “Teppanyaki（鉄板焼き）”. The popular menu of this store is “Pachi Pachi Yaki(88焼き)”.Okonomiyaki with pork, potato, shrimp, egg, cheese and green onion.Plump dough and plenty of ingredients are very good. It is a popular shop in the Ginza area.Reservation is good early. This store is a hideout cafe & dining bar located in the heart of Ginza.The shop is characterized by the image of a French apartment. Appetizers, salads, pasta, and pizza are prepared, focusing on Italian and French cuisine.It also has a cafe menu, so it’s more than just a meal.It is also recommended for the purpose of taking a break. A 3-minute walk from Ginza Station. This shop is immersed in the retro atmosphere of France. Here you can enjoy Chinese food casually.It is a fashionable Chinese restaurant with a modern interior.The shop is a modern casual space based on white.In particular, the counter seats are stylish. Appetizers are 300 yen uniform and very cheap in the Ginza area.The main dish can be discounted at around 1,000 yen.There are nearly 20 types of appetizers, so you can be very satisfied with the appetizers alone. It is a 5-minute walk from Ginza Station. It is recommended if you can enjoy Chinese food in a stylish store. This shop is a popular Italian bar introduced to Japanese gourmet magazines and TVs.It is behind the famous “Kabukiza” in Ginza. The popular menu is “Rear cutlet（レアカツ）” which uses the beef sirloin.It’s crispy on the outside and soft on the inside.The deals you can get for 980 yen is a menu you want to recommend. It is a 6-minute walk from Ginza Station.If you want to use Italian for deals around Ginza, it’s a great restaurant. This is a Vietnamese restaurant specialty store located on the first floor of “GINZA5”, a 1-minute walk from Ginza Station Exit C1.The store is as if I had visited Vietnam, which is a space that does not seem like Ginza. The attraction of this restaurant is that it has a wide variety of menus unlike Japanese Vietnamese restaurants.You can eat Vietnamese food in the north, middle, south and all areas.Therefore, we also handle core menus that are not known overseas. It will be unbearable for Vietnamese food lovers. We introduced sushi, craft beer, local cuisine, okonomiyaki, dining bar, Chinese and Vietnamese cuisine, and various gourmet spots around Ginza. There are many luxury shops in Ginza, which often cause them to be over budgeted.However, there are shops in Ginza where you can enjoy eating and drinking at low prices. I would be glad if this article could be used as a reference for low-priced Ginza restaurants. Copyright © 2019 東京・埼玉グルメスポットガイド All Rights Reserved.